While the FBI investigation into allegations against Trump’s Supreme Court Nominee Brett Kavanaugh has come to an end, many Democrats feel as though it was an unfair, curtailed, and incomplete examination of events and accusations. With multiple women alleging sexual misconduct on behalf of Kavanaugh, the investigation only interviewed one of three victims — Deborah Ramirez — while Christine Blasey Ford and Julie Swetnick were mysteriously left out of the interview process. 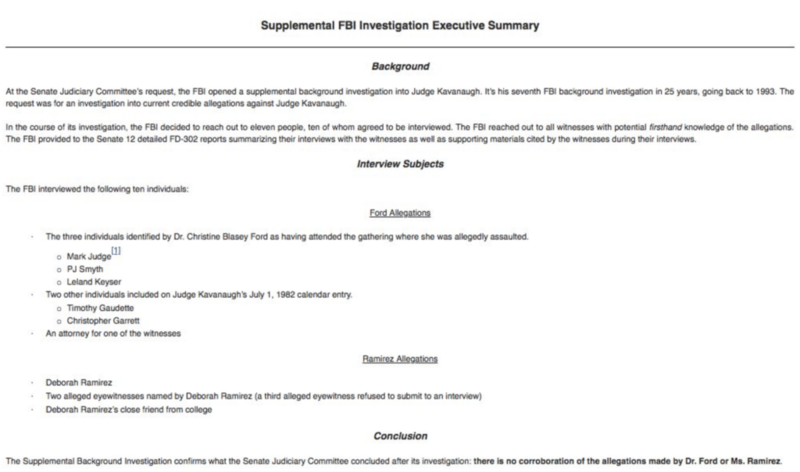 Early this morning, the Chairman of the Senate Judiciary Committee, Chuck Grassley, released a statement (seen below) that included a list of the 10 names who the FBI had interviewed as part of the investigation. Today the Senate is expected to vote on whether to advance the nomination of Kavanaugh. There are still several Senators who remain undecided.